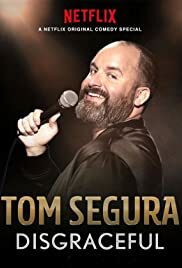 Tom Segura breaks down the “Which physical injuries are cool to make jokes about?” rule of comedy for all of us. Disgraceful premieres January 12 on Netflix. We like foreigners and we like cursing. When foreigners curse? Magical. Plus, you have SERIOUS questions about Blind people and their standards, twin girls, and now yellow is brought into the equation – does it affect farts?? Tommy’s parents are about to retire. Wait until you hear about Top Dog’s newly crushed adventure. And don’t forget to check out DISGRACEFUL – Tom’s new 1 hour special. It begins streaming worldwide on NETFLIX January 12.